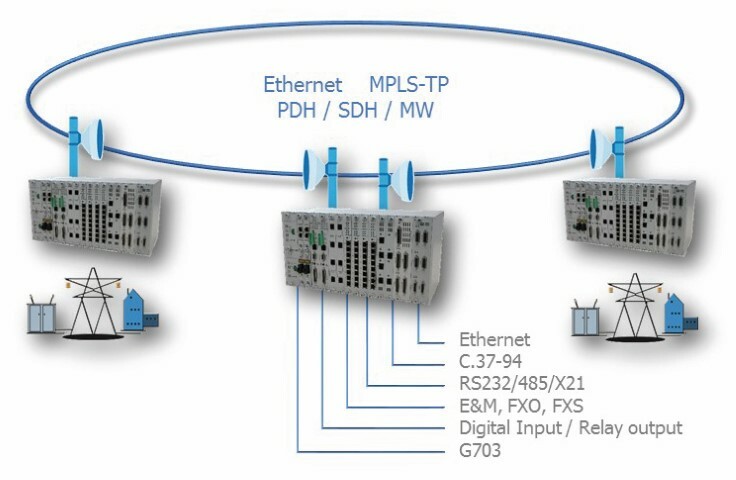 CXR multiplexers are key infrastructure Transport and Distribution network equipment. SONET / SDH multiplexers enables high speed and resilient backbone networks with 155 Mbps to 10 Gbps bandwidth, OC-3 / STM-1 to OC-192 / STM-64. Substation multiplexers and channel-banks provide all required communication interfaces - E&M/FXO/FXS voice, RS232/RS485/V35, Ethernet, C.37-94, digital inputs and relay outputs, etc. Communication media may be made of fiber, copper or microwave links. CXR products differentiate from their sustainability, flexibility, scalability with STM-16 rate and TDM-over-IP encapsulations, ring protection functions, and total redundancy of power converters, communication cards and processor modules. The HX-9500 is an integrated multiplexer with combined SONET/SDH communication and E1/T1 channel bank with DS-0 interfaces - voice, RS232, Ethernet, etc. that saves a lot on CAPEX / OPEX / TCO, rack space and power consumption.